Producers of the Zora Neale Hurston Festival of the Arts and Humanities will pay tribute to Alice Walker, Pulitzer Prize recipient, novelist, short story writer, poet, and activist during its 30th anniversary banquet tonight, February 2nd, at University of Central Florida Pegasus Ballroom. Walker will be on festival grounds in Eatonville signing her new book Taking the Arrow Out of the Heart on Sunday, February 3rd, at 1:00 pm. Walker became the first African-American woman to receive the Pulitzer Prize for Fiction for her groundbreaking novel, The Color Purple, in 1983. The novel was the inspiration for famed director Steven Spielberg’s 1985 Hollywood film and was adapted as a musical for the stage by Scott Sanders. Her writings have been translated into more than two dozen languages, and her books have sold more than 10 million copies. 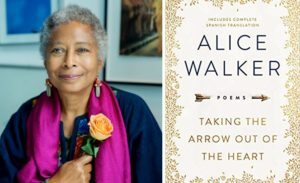 “We are privileged to host Alice Walker during our 30th anniversary festival banquet. Walker is a celebrated literary icon and her work is highly regarded by people globally. We are also grateful to our co-host, the Collegium for African-American Research (CAAR), for making this evening possible,” said N.Y. Nathiri, executive director of the Association to preserve the Eatonville Community and the general manager of the Zora Neale Hurston Festival of the Arts and Humanities. The festival is slated to be a time of celebration, education, and collaboration as attendees gain insights from the work of Zora Neale Hurston and other influential individuals of her time period into the present. Click here for additional information on ZORA! Festival 2019 events.